For someone who is starting to get hooked in smoking and grilling, the Brinkmann Gourmet Smoker and Grill is a nice investment. With electricity as the heat source, cooking with this grill is fast and easy. However, its cooking capacity is limited for only a small number of people. For a smoker and grill rolled into one, this grill is relatively cheap as compared to other similar products. Weighing only 28 pounds, moving this grill from one place to another is will not cost any sweat. This grill can serve two purposes: it can be a smoker and waist- high grill. Electricity fuels this grill and cooking on it does not require constant monitoring of temperature. 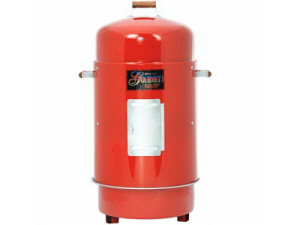 Bullet type grills allow vertical smoking that cooks up the meat slowly for a deep smoky flavor. Utilized in this grill is a water pan that provides a moist cooking environment inside the grill making the meat tender and juicy. Two cooking grates are included in the package to simultaneously cook up to 50 pounds of meat. This grill is made up of steel to stand the test of time and specific parts are chrome- plated to prevent from rusting. Parts are removable for ease of cleaning and can easily be assembled. When doing long and slow cooking on cold or windy days, the temperature is very difficult to maintain due to the thin metal covering the grill has. Temperature fluctuations add a significant amount of cooking time. This grill does not have vents so it’s loosely fit lid makes up for controlling the smoke. The heating element is not adjustable and there is no thermometer to gauge the temperature. This grill’s body is not big enough to allow bigger chunks of meat like ribs for cooking. Adding water and chips is made difficult with its small door. A Basic Smoker for Beginners! Considering the cost and the functions of a Brinkmann Gourmet Smoker and Grill, this is a practical option for a smoker newbie. Its reasonable price and performance is adequate to fulfill its basic purpose of smoking and grilling for a relative small party!